Join professional and aspiring photographers for months of workshops and gallery exhibitions in the Tuscan city of Cortona to celebrate photography both new and old this summer. Cortona On The Move (OTM), an annual photography festival, combines renowned photographers with contemporary and archived work to present a festival that will run from July 14 to October 2. Located in the province of Arezzo and the de Medici Fortress of Girifalco, Cortona has been hosting the public festival since 2011. The idea was born from the cultural association, ONTHEMOVE, created with the goal of promoting visual arts and photography. The motto of the festival, “Fotografia in Viaggio,” expresses OTM’s goal of taking participants on a journey through generations of historic photos until today’s contemporary works. The festival will feature 10 exhibitions from contemporary photographers. 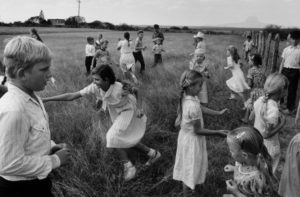 This year’s special event will be “The Larry Towell Show,” which is Canadian photographer Larry Towell’s first European show. The show includes photos from his time spent in Afghanistan, El Salvador, and Palestine, as well as more intimate works of his family. Among the exhibitions is also Darcy Padilla’s “Family Love,” a project that stemmed from her time photographing AIDS patients in San Francisco when she met Julie Baird, a 19-year-old new mother who had just been diagnosed with AIDS. Over the course of the following 21 years, Padilla photographed Julie and her family. This collection beautifully depicts a family of people who love each other while struggling with poverty, drug and sexual abuse. The gallery will exhibit photos from this project, which Padilla put together into a book published in 2014. Also to be presented during OTM are five photo projects selected by Circuito OFF, which will be showcased in Vecchio Ospedale, located in Cortona’s city center. Festival artistic director Arianna Rinaldo and members from both the ONTHEMOVE association and EyesOpen! — a photographic culture magazine — received over a thousand submissions from the public. Apart from the five photographers who will be featured, an additional 10 will have their work presented on one night of the festival, which has yet to be announced. In conjunction with Lecia Akademie, OTM will offer four workshops with professional photographers, three of whom will also display their work in exhibitions at the festival. The workshops will take place over three days, from July 14 to 17, and are open to all guests on a first come first serve basis. Pichler’s work is currently displayed in the Gallery Anzenberger in Vienna, where he lives and works, as well as in Gallery Rockelmann & located in Berlin. Guests will also have the unique opportunity to share portfolios with photo editors from publications including The New York Times in Paris, Financial Times Weekend Magazine, and Marie Claire. Guests can reserve either a basic (20-minute slot) or premium (1-hour slot) meeting with a photo editor, and reservations can be made online through the OTM website. OTM has witnessed a dramatic improvement in the number of attendees over the past few years, this year marking a 30% increase of participants. Festival organizers are excited to welcome photography lovers to enjoy fantastic work and learn from professionals once again during this edition.